This may be Andrew Cartmel’s debut novel but he is a very experienced writer with his script writing on Dr Who being well respected, for example. He came to my attention as the co-writer of the Rivers of London comics with Ben Aaronovitch and I was intrigued by the synopsis of this book. This is a light (very light) detective story that is at times quite absurd but in a most endearing way in my opinion. The protagonist, who remains unnamed in the book, is an unusual one for a detective mystery. As the name of the series indicates he is not a police detective but an everyday guy who scrapes a living (for himself and his cats) buying and selling records and finds himself up to his neck in trouble and mystery when he is hired by a mysterious and, of course, incredibly beautiful woman to find a particular rare record. The book is written in two parts which I did not pick up on to begin with despite it stating “Side One” at the start of the book. I must confess I was somewhat confused approaching the middle of the book as to where the plot was going as it appeared to be wrapping up but then it was on to “Side Two” and the story took off again in a different direction. This was a clever and unexpected parallel with a vinyl which I have not seen before and really enjoyed. Cartmel’s writing talent shows through particularly in the scene setting and dialogue and this book was funny and entertaining as long as you don’t look too deeply. 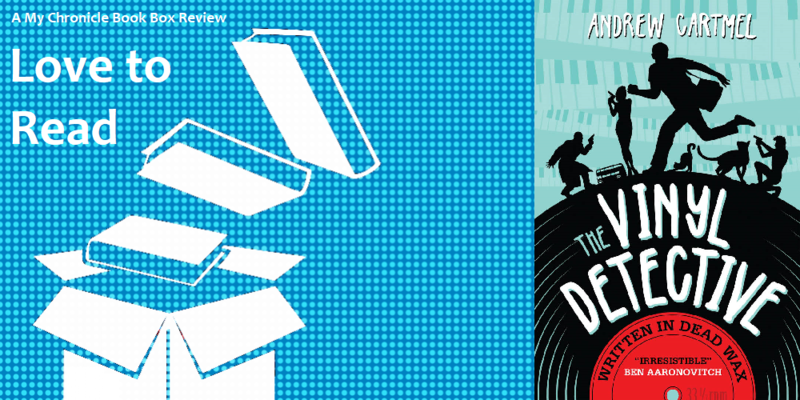 I suggest you switch off and enjoy this quirky, fast paced romp through the geeky, cut-throat world of vinyl collecting. I would point out I have no prior knowledge of vinyl, record collecting or Jazz and while I did not need any to enjoy this book I also didn’t feel overburdened by the detail provided in this regard. I am pleased to say that Cartmel has already written two more Vinyl Detective books; The Run-out Groove due for release in May 2017 and Victory Disc to be released in May 2018. I am looking forward to seeing how our favourite unnamed Vinyl Detective handles being wanted by more than one hot babe and what ludicrous trouble he finds himself embroiled in next. And perhaps Mr Cartmel will gift us with the Vinyl Detective's name in the next book?